The classic Pokemon games will be coming to the eShop on February 27th. Japan gets 3DS carts though. I might get Yellow at some point since I always wanted to try the game. I think I'll pass. Nice to see their getting released to the 3DS thou. That's pretty good. I always thought they'd have a little difficulty adding the Pokémon games to the Virtual Console because of trading, they must have some solution for it. I always enjoyed the games although those serious glitches like ghost types not dealing super effective damage like they're supposed to don't happen and such are awful. I'll get Pokémon Yellow because I never had it as a cartridge. Maybe I'll finally catch 'em all for once! I don't even want to purchase these but it took them WAY too long to do this. I honestly have no idea why they weren't available years ago, but regardless I guess it's cool to see them coming. I'll probably get Yellow, never actually got it when I was younger, and I really wanted them to do this since they started putting old games on the eshop. 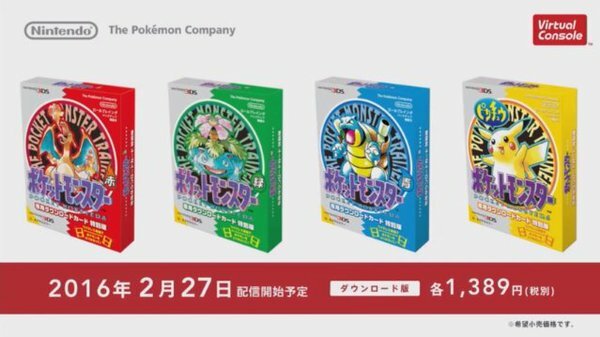 I'm probably not getting any of these, because Yellow is so painfully nostalgic and I've played Red not too long ago, but it's nice to see that Nintendo/Game Freak finally came to their senses. I wouldn't have mind had it happened a few years earlier, though. "And the person who says that the only way to please them is to restrict options for others is, if you ask me, the one who deserves it least." The games will be $10 each. Honestly a little too expensive, but I'm not surprised with GameFreak/The Pokemon Company. I feel like $5 would be a more fair price, but this is a big deal for some people so it makes sense. Me wantie - enabling wireless communications definitely will be a great replacement for the link-cable. It's too bad you can't trade between the multiple titles on the same 3DS though. Maybe if Bank opened up to letting RBY connect, but unless they find a way to block all the potential glitch pokemon (mostly those obtained by the Old Man glitch), that would be awesome. Level 180 Rapidash, Clefable, and Mewtwo as well as Level 100 Mew glitched Pokemon. Does anyone else find it a bit odd that they announced this back in November yet we're still a month out from release? I mean, they're just Virtual Console rereleases so I feel like they should've been out by now. Maybe it's just the fact that Japan is getting physical copies. I think they wanted to release the games on the day they come out. I also think the Pokemon Company and Gamefreak wanted February to be the month they show off the latest main Pokemon game.